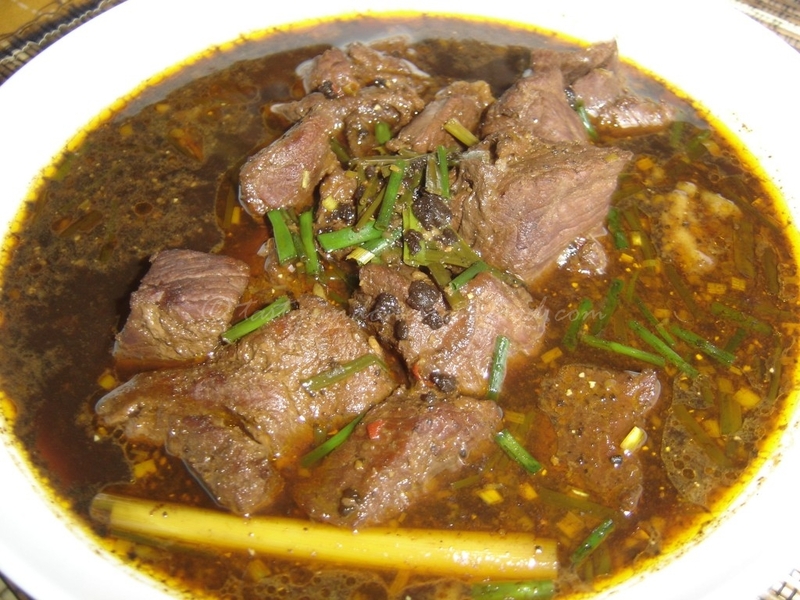 Rawon is a speciality from East Java, made from beef with a special spice called kluwek. When you have the chance to visit East Java, especially Surabaya, you should try it. There are some recommended restaurants that serve a very delicious Rawon. Even though sometimes the colour makes you wonder whether you should eat or not, the fact is this soup is really delicious. It’s good to serve it with white plain rice (nasi putih). And this dish is one of our favourite Indonesian foods, especially for my hubby. 1. Put the beef and water in a large pan and simmer uncovered until beef is tender. When it’s tender, separate the meat and cut into small cube. Bring back to boil with low heat. 2. Grind or blend the spice paste. 3. Heat oil in heavy stock pot and sauté the spice paste together with lemongrass, galangal, salam leafs, lime kaffir leafs and kluwek over low heat for 3-5 minutes. You can add chilly powder or paprika powder if you like. 4. Bring the frying spice mixture into the pan with beef, simmer for 20 minutes. Season for taste with salt and pepper. Always add some more water if it’s necessary. 5. Before it’s done, sprinkle with spring onion. Cook for another 5 minutes.